While the need for tree care or tree removal services can arise throughout the year, the winter weather conditions seen in Uxbridge, Whitchurch-Stouffville, Newmarket and their surrounding areas can often intensify the urgency for such actions. Severe winds, heavy snowfalls, sleet, and/or freezing rain can cause widespread damage to trees; this in turn can cause large branches or entire trees to fall, resulting in property damage and posing threats to the health and safety of local homeowners and their families. The unpredictability of winter storms and their intensity is fact of life for the residents of communities in and around the Greater Toronto Area (GTA). Though meteorologists will provide advance warnings of imminent storm activity, such information tends to focus on personal protection against the elements as well as travel precautions; there is little that any property owners can do in that short pre-storm period to protect their trees from the conditions about to pass through the region. This is why homeowners and business owners should take pre-emptive actions to assess whether their trees are at risk of falling during a storm, especially if there are indications of a rotted or damaged tree. This can be done through visual inspection by the property owner or a professional assessment by the tree care qualified experts from DreamWorks Tree Services; subsequently, if there is sufficient risk that a tree might not withstand the rigours of a storm, the team at DreamWorks Tree Services can provide safe and effective tree removal services to avoid the likelihood of any personal injury and property damage in the future. Should property owners within or near the GTA have any trees that are exhibiting one or more of the above risk factors, it would be highly advisable that they contact the experts from DreamWorks Tree Services to remedy the situation as soon as possible, as a means of protecting themselves, their neighbours, and any adjacent buildings/property from the potential adverse effects of future storm conditions. As noted above, tree removal may be the best course of action when there is a high risk of personal injury or property damage during or after storms; this is perhaps only option when dealing with a rotted, diseased, or dying tree. In some situations, however, there are alternatives that could be pursued which can help to strengthen and ultimately save the tree. 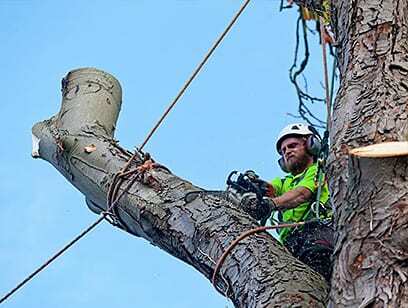 The most appropriate remedy would be identified through a comprehensive assessment by a tree care professional such as a qualified arborist from DreamWorks Tree Services; this assessment would verify whether the tree and stump should be completely removed or if some type of corrective measure would be appropriate to help preserve its health. Go to tree removal to learn more about tree removal and other tree care services offered by the qualified specialists at DreamWorks Tree Services to property owners in and around the GTA including Uxbridge, Newmarket, and Whitchurch-Stouffville. If you suspect or have evidence that a tree or trees on your property may be at high risk of falling during or after a storm, call the tree removal and tree care professionals from DreamWorks Tree Services today at 647-793-8903 or contact us to arrange for a free assessment and recommendation on the most appropriate course of action. While the need for tree care or tree removal services can arise throughout the year, the winter weather conditions seen in Uxbridge, Whitchurch-Stouffville, Newmarket and their surrounding areas can often intensify the urgency for such actions. Took a galley of type and scrambled it to make a type specimen book. It has survived not only five centuries.